When I started the Positive Discipline Network, I had no idea it would be so gratifying. Members are so supportive and encouraging to each other. And, they share such great material. Heather Hurtt gave permission to use her example in the following article. When your children are biting, hitting, fighting with each other, are you able to stay calm and loving, or do you lose it? One mother shared, “I have a 1-year-old daughter and 3-1/2-year-old son and at times my son hits his sister, hits me, hits other kids at the playground. It's normal for this to totally get to you and I have totally lost it completely on more than one occasion with my son because I could simply not take it anymore and be calm. 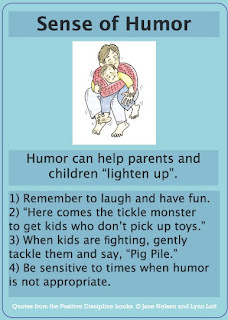 One of the things I do now to try and diffuse it for him and to stay calm for me is to use humor. First, I'll try to validate the feeling - like I see you want some attention from Mommy and then in a silly voice..."Mommy likes kisses, not hitting or biting," and I'll grab both arms and give him some funny kisses on his face, neck or arm, etc., and then throw in a tickle. Another idea could be to validate and then simply say, “Ouch, hitting hurts,” and then redirect immediately with something physical like, “Let's race to the kitchen,” and then later on do a role-play about it with her and what other type of behavior she could use. Kelly Heet gave permission to use her name (and her husbands) for the following tip: Just a tip for those of you who have husbands who aren't "readers"... try the CDs! My husband always says he doesn't have time to read parenting books, but when I gave him the CDs to listen to in his car, he thanked me profusely and said "now I can see why you've been wanting me to do this!" First I want to share the exciting news that Laura Garcia is offering another 2-day workshop on Teaching Parenting the Positive Discipline Way in Spanish. For more information on here workshop and all the other 2-day workshops, go to www.positivediscipline.org. First off, take some time-out for yourself. When I find myself getting to my wits end, I know that I have been neglecting myself. Even just taking an hour to do something for you (with no kids) can probably work wonders. 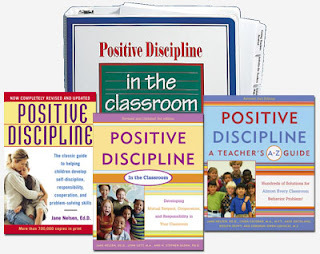 Next, Have you read any of the Positive Discipline books? If not, I'd highly recommend it. If you are looking for some overview material, check out the PD website, and listen to the podcasts. We've all been there (feeling like there is nothing that works, and nothing left to try...), but please give PD a chance. It has been a godsend to our family (and so many others). The #1 thing you will discover is that children WANT to feel like they belong, and that they are making a significant contribution... so helping them to find a way to do that helps to eliminate soooooo many of the problems that we all used to have with more traditional discipline methods (read: punishments). 1) What can you do to help Mommy? 3) Would you like a hug? 4) I see that you are very upset right now... I can understand that. 5) I love you and the answer is no. 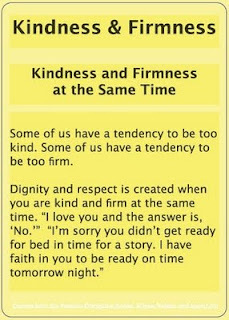 When I started using PD, I started with a routine chart for both morning and bedtime... and that alone helped cut about half of the battles I used to have with my son. Just a suggestion. This is just one example of the encouraging support offered by so many members of the PD Network. Thanks so much to all of you. 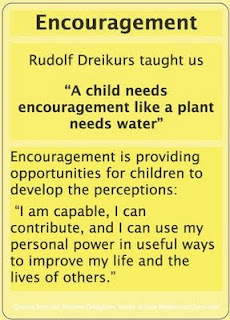 Since encouragement is so essential, it would be good for parents to know exactly what encouragement means and how to do it. Let’s start with what encouragement is not. Parents talk too much. Sometimes the talking is called “lecturing,” and sometimes it is an attempt to be encouraging. A trend today is for parents to think they have to make a comment (in the name of encouragement) on everything a child does. Even worse is when they think they should clap and cheer. Imagine you are a two-year-old child and you have just poured your own milk from a small measuring cup into a small cup. What are you feeling? When I get into that role, I’m feeling proud of myself—and very capable. Stay in the role and now imagine your mother starts clapping and cheering? The most popular cheer is, “You did it!” What are you feeling now? When I get into that role it is interesting that I still feel proud. I even like it that my mother is cheering. However, when I dig deep, I’m starting to believe I need to do well to please my mother. Clapping and cheering is a form of praise, and the danger is that children do like it. They don’t understand the subtle beginnings of the need to please and/or the fear that they might not—or the power to rebel as the only way to hang on to themselves. All of these feelings and decisions are being formed at a subconscious level. 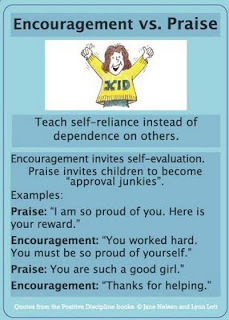 Cheering, clapping and commenting on everything a child does are subtle ways of making your child’s accomplishments more about you than about him or her. It actually robs your child of maintaining his or her sense of personal satisfaction and feelings of capability. So, now I must go back to what encouragement is not. What would happen if the mother bird felt guilty about pushing her baby bird out of the nest so it will learn to fly? The baby bird would not survive. How well do our children survive when they don’t develop their disappointment muscles, their resiliency muscles, their delayed gratification muscles, and their courage to be imperfect muscles? When parents rescue, fix, and overprotect, they rob their children of the opportunity to learn that they can survive disappointment; that they can survive the ups and downs of life and learn many life skills in the process. 1. Family Meetings where children learn to give and receive compliments and learn to brainstorm for solutions to problems. 2. Curiosity Questions to invite children how to think instead of what to think—and to give them a sense of choice to use their personal power for social responsibility. 3. Letting Go so children have opportunities to learn and grow—mistakes and all. 4. Having Faith in children so they can develop faith in themselves. 5. Spending Special Time to make sure the message of love gets through. There are many more—all designed to be empowering instead of enabling. A new Positive Discipline tool is called Energetic Encouragement. Sometimes, the most encouraging thing a parent can do is to sit close by and keep his or her mouth shut while simply sending out energetic support. A unique feature of Positive Discipline parenting classes and workshops is to use experiential activities to help parents practice skills and “get into the child’s world” to process the effects of their skills. Are you promoting SELF-evaluation or dependence on the evaluation of others? Are you inviting your child to think or telling him what to think? Are you allowing your child to figure things out for herself or engaging her in problem solving), or are you rescuing and fixing things for her? Are you considering what your child might be thinking, feeling and deciding in response to what you do or say, or do you avoid getting into your child’s world? Are you helping your child feel capable or dependent? After several years in the making, they are at the printers. Choose one card and practice for a week. In one year you’ll be a perfect parent— or you can start again. When faced with a challenge, choose a card at random. Chances are that it will be the perfect tool to solve the problem while teaching your child self-discipline, responsibility, cooperation, and problem-solving skills—or you can try another card. Invite your children to choose a card and let you know if it is the tool that will solve the problem—or keep choosing until they find one that will. Available at http://www.empoweringpeople.com/ under products for parents. 2) You can start your own Positive Discipline group. Perhaps you would like to find others in your area. 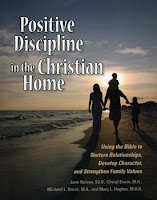 3) Questions and answers on the practical application of Positive Discipline. 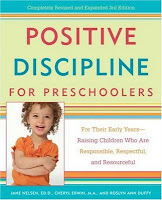 5) Book excerpts from the book being written by me and my daughter on "Positive Discipline the Second Generation: Easier Said than Done," in the PD the First Three Years Group (which will eventually move to the PD for Preschoolers group as the "boys" get older). 6) A group for Positive Discipline Parent Educators to share new activities and other ideas (plus info on how to become a PDPE). 9) Your own profile page where you can post photos and even an RSS feed to your blog if you have one. (Check out Brad Ainge's blog on Single Parenting. You will laugh out loud--or cry with empathy.) Brad is a member of the Single Parents Group. Become part of a Positive Discipline community dedicated to creating peace in the world though peace in homes and schools.